Last week there was a lot of talk on the news about some guy named Bill, so on this edition of the show we'll hear some rapidly rotating records about some guys named Bill, but definitely NOT the one on the news. The Great American Eclipse will take place in August, so we'll have some songs about Mr. Sol. We'll also do some bending, pick some sunflowers and get horny (!!) 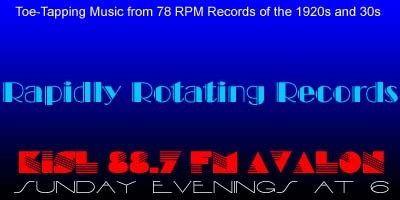 Several records on this week's show are making their RRR debut, so let us know which is your favorite. Where Is The Sun? – Stuff Smith and His Onyx Club Boys / Stuff Smith, v.
Who's Been Polishing The Sun? – Sidney Kyte and His Piccadilly Hotel Band / Norman Phillips, v.
By The Bend Of The River – Harry Hudson and His Band / Sam Browne, v.
Bend Down, Sister – Jimmie Grier AHO / The Three Ambassadors, v.
Sunny Sunflower Land – Noble Sissle and His Sizzling Syncopators / Noble Sissle, v.
Someone Stole Gabriel's Horn – Jack Teagarden and His Chicagoans / Jack Teagarden, v.